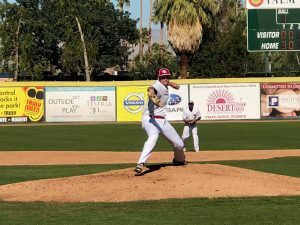 PALM SPRINGS, Calif. — Another Saturday of action at the California Winter League opened up with the Alberta Grizzly and the Palm Springs Chill playing each other for the second straight day. The game ended in a 4-4 tie. In what turned out to be a pitcher’s duel, the Grizzly opened the scoring with three runs in the third inning. Carl Witkowski and Gabe Gunter each had RBI singles, which drove in the first two runs, and the third run scored on an error. The Chill scored a run in the fourth to make it 3-1, then took a 4-3 lead in the fifth on Elijah Briseno’s three-run home run over the right field wall. The Chill took their one-run lead into the top of the seventh inning with a chance to close out the game, but the Grizzly rallied to tie the game 4-4. Jeturi Brown walked to start the inning, then pinch-runner Landon Lau eventually came around to score on Witkowski’s sacrifice fly to left field. The Chill had a chance to win it in the bottom of the seventh and got a man into scoring position, but could not push across the winning run. Extra innings are not played in the California Winter League unless both managers agree to play one extra inning, and neither team had enough pitching to play another one, so the game ended in a tie. Logan Campbell started for the Chill, going four innings while allowing three runs (two earned) on four strikeouts. Austin Bueter started for the Grizzly and gave up four runs (three earned) with six strikeouts in four and two-thirds innings. Game two featured the Palm Springs Power defeating the Manitoba North Stars, 6-1. A three-run bottom of the sixth inning for the Power put the game out of reach. Palm Springs (8-4-1) got on the board first with an unearned run. Jake Willsey reached on an error and later scored on a Taylor Grace sacrifice fly. Manitoba (7-5-1) tied it in the next half inning. Cosimo Cannella started the rally with a one-out single. Alex Rojas followed with a double, and Alex Rojas’ groundout to short scored Cannella from third. That would be all for the North Stars offense, as four Power pitchers allowed just two base runners the remainder of the game. The Power took a 2-1 lead in the second after Cletis Avery scored on a double by Jake Willsey. On the play, the trail runner, Christian Lyman, was cut down at home plate on a beautiful relay from Will Krug to short stop Adrian Guzman, who threw to the catcher Rojas. Stefano Belmonte’s RBI double increased the Power lead to 3-1 in the third, and in the sixth, Palm Springs pushed across three more on a two-RBI single from Hayden Mahe-Liessmann, as well as a Belmonte sac-fly. Chris Lumanlan (1-1) earned the win after allowing one run on two hits with four strikeouts. Kyle Brown, Christian Colletti and Tyler Sharp combined for three shutout innings of relief with only one hit allowed and five strikeouts. In game one on the auxiliary field, the Washington Blue Sox defeated the Canada A’s, 8-1. Blue Sox (9-4) starter Joseph Costello (4-0) got the win after a sparkling six-inning effort in which he allowed one run on two hits while striking out nine. KC Huth had three RBI and Cody Den Beste went 3-for-3 with an RBI and a run scored. Jovany Felipe homered for the A’s (7-5) to represent their only run in the contest. The Toronto Rush defeated the British Columbia Bombers 4-2 in game two of the afternoon. Trailing 2-0 in the third, the Rush (7-6) got two RBIs on a Robert de Angelis double along with another run scoring on a Jon Bannister sacrifice fly. Jordan Zazulak hit a two-run home run for the Bombers (2-9-2) in the first inning, but could not muster another run. Andrew Baxter was credited with the win (2-0) through three innings pitched. Matthew Dallas earned the save (2) after 2.1 innings of work. Sunday, February 11 is “Super Lotto Sunday” at Palm Springs Stadium. Attendees will receive a free California Super Lotto ticket for the first 100 who purchase tickets. Sunday’s matchups consist of the British Columbia Bombers against the Coachella Valley Snowbirds at 10:00am. The Oregon LumberJacks and Alberta Grizzly will follow at 12:30. Those not in attendance can listen to the broadcast live on CaliforniaWinterLeague.com.